California is burning, and the climate crisis is to blame. More than 200,000 people had to be evacuated from their homes in Southern California in December — and these blazes come on the heels of an year of fires in that have left unprecedented destruction in their wake. Governor Jerry Brown wants the world to see him as a global leader on climate change, but his record has been mixed. Add your voice today to call on him to put his words into action and come out in strong support of SB 100 — an ambitious, visionary bill that would commit California to 100% renewable energy by 2045. The climate crisis is here, and the solutions we need can’t wait. Governor Brown: the climate solutions we need can't wait. I’m calling on you to support SB 100 and commit to 100% renewable energy for California by 2045. This bill is exactly the kind of policy we need to fight climate change right now. As the federal government tries to take us backward on climate, passing it will position California as a global leader. And with the climate crisis devastating California today, we can’t afford to wait any longer for the real solutions we need. 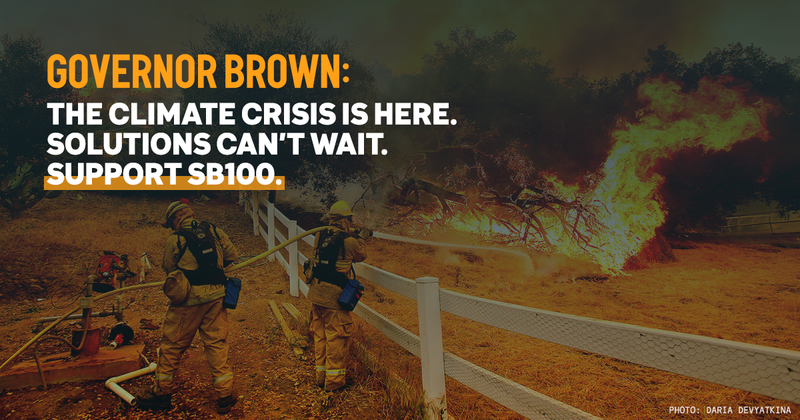 Thank you for calling on Jerry Brown to turn his words into climate action by supporting SB 100. The climate crisis is here, and the 100% renewable energy future we need can't wait any longer. California is burning, and the climate crisis is to blame. Speak up today to call on Gov. Jerry Brown to put his words into action and support SB 100 —an ambitious, visionary bill that would commit California to 100% renewable energy by 2045. The climate crisis is here, and the solutions we need can't wait.